For most traders Andrews Pitchfork is a technical analysis tool you may have applied to your chart once or twice, fooled around with it, but couldn’t really understand what it was supposed to do. Well, basically it provides support and resistance levels, and can therefore be used to confirm trends and spot reversals. The indicator is named after the founder Alan Andrews, and is aptly named as it looks like a pitchfork. To use the tool we must isolate three points. Say we want to apply the pitchfork to a current uptrend. Looking back on our chart we locate a bottom, near where the uptrend began–this is point 1. Points 2 and 3 determine how wide the forks are on our pitchfork. Point 2 is attached to a high point before a pullback, and then Point 3 is attached to the low of that pullback. 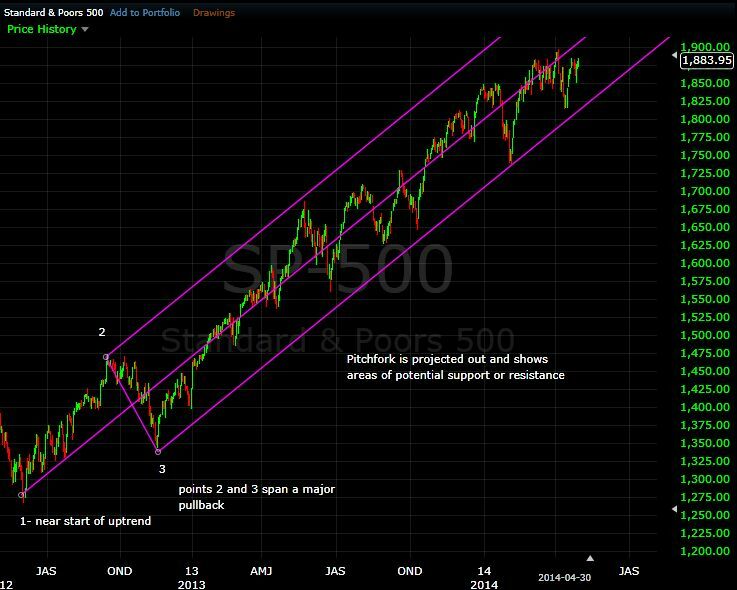 The pitchfork is now drawn, and shows areas of likely support or resistance. As long as the price stays above the pitchfork bottom, the uptrend is in place. If the price drops out of the pitchfork, then the uptrend has likely begun a reversal. The chart above shows the indicator, and how it is used. Points 1, 2 and 3 mark the start of the uptrend and the first pullback, which then provide a guide for the rest of the trend. Since the price is staying within the pitchfork we can assume the trend is still up. When it breaks below the pitchfork–especially since the fork has held for so long in this case–we can assume the uptrend is over. While a daily chart is used, the pitchfork can be applied to any time frame. The uptrend is now defined, and the lower fork should provide support, and in this case it does. How the price is moving between the forks also provides insight. The middle fork acts like an average. So if the trend is strong, the price should be reaching the middle fork on a regular basis. If the price makes it to the upper fork, or frequently trades above the middle fork, the trend is very strong. If the price begins to only move between the lower fork and middle fork (without moving above) then the trend could be weakening. As indicated prior if the price drops below the lower fork in an uptrend, then the trend could be reversing. The opposite would apply for a downtrend. The top fork provides resistance for the overall downtrend, and if the price breaks above it, the downtrend may be reversing. For the downtrend, you want to see the price dropping below the middle fork occasionally to show the trend is strong. If it trades between the middle and bottom fork the trend is strong. If it begins to only trade between the middle and top fork, then the downtrend may be weakening. There is leeway in drawing this tool, because using slightly different prices for points 1, 2 and 3 can make a big difference in the angle of the pitchfork. If you draw a pitchfork on an uptrend, and the price keeps breaking through the bottom of the pitchfork (for example) but then the price keeps going higher after, then uptrend is still intact, and it is your pitchfork which needs to be adjusted. Start with point 1. See if you can change it to a slightly different starting point so that the bottom fork aligns with major swing lows you see on the chart. If you refer back to figure 1, notice how the bottom fork aligns nicely with the lows? That is because I slightly adjusted point 1. I didn’t put point 1 at the exact low of the move. If point 2 or 3 were based on a very small pullback it is inevitable a larger pullback will develop at some point. Once that pullback has occurred, and you can see the trend is still up, points 2 and 3 can be placed on the bigger pullback, since this will give you better idea of when the trend is actually reversing in the future. Ultimately, you want a pitchfork on your chart that is useful. Since markets don’t move in perfect synchronous patterns, sometimes that means we need to fine-tune our indicators so they are useful on the price chart we are watching.